The story behind this recipe, Williams-Sonoma Herbed Quinoa and Red Rice Stuffing, began a few years ago when I was a seasonal sales associate at my favorite store. Starting in October, Williams-Sonoma begins showcasing their wonderful holiday foods and kitchenware. 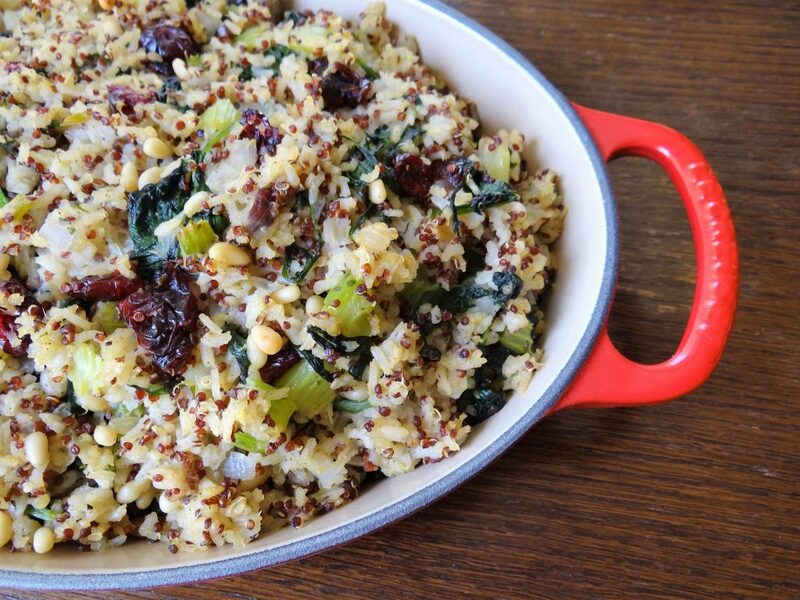 This particular season they introduced an Herbed Quinoa and Red Rice Stuffing mix. We made it often in the store so customers could sample it and it was an instant hit. Well, as it sometimes happens in retail stores, the item was discontinued. Customers continued to ask for it every holiday season, but unfortunately we had to tell them the fate of their beloved stuffing. So, for one of my cooking classes, I decided to recreate the recipe for Herbed Quinoa and Red Rice Stuffing with the help of the recipe that was posted on the Williams-Sonoma website. Their recipe still called for the stuffing mix that they had carried in the store, but with a few substitutions, I was able to create a recipe that was very similar. I started with a rice and quinoa mixture that I found in my local grocery store. Of course there was one that I loved, that they do not carry anymore. Go figure. But, I was determined. So I tried different types of rice/quinoa blends and found one that worked really well. Now the recipe is called Quinoa and RED RICE Stuffing. Actually the blend I found was a light brown rice and red quinoa combination. There are a lot of great products out there to choose from, so whether it is a brown or red rice, white or other color of quinoa, just find the one you like. What makes this stuffing recipe so good is the combination of flavors. The base of sauteed onions and celery give it that familiar stuffing taste. 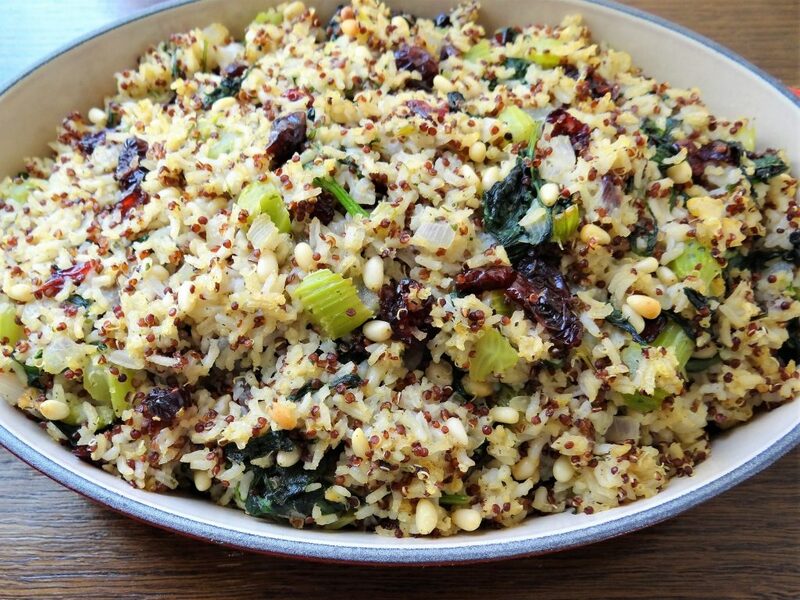 Then, the addition of the rice and quinoa medley, fresh kale and lemon zest, topped with sweet dried cranberries and crunchy pine nuts, come together in perfect harmony. And finally, you are given the option of adding your last savory touch of shredded Parmesan cheese. The icing on the cake! 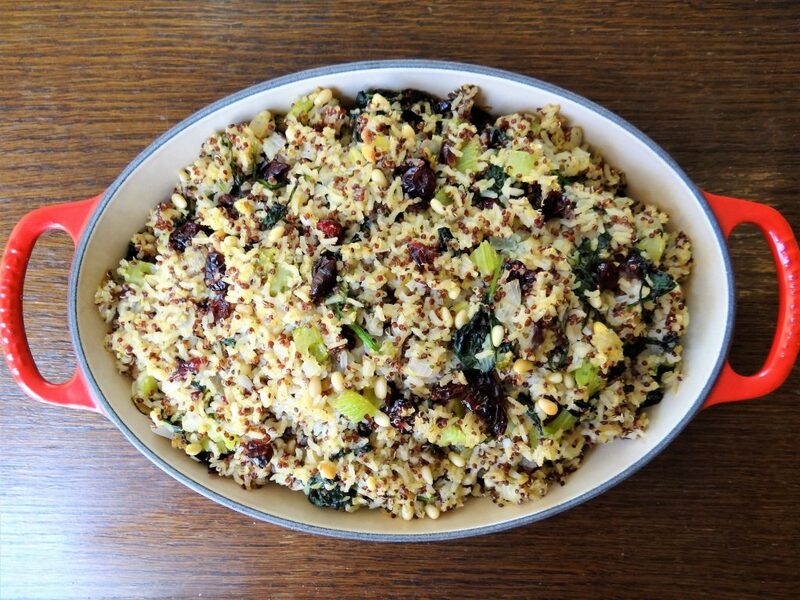 So enjoy this new recipe for Herbed Quinoa and Red Rice Stuffing for the holidays or anytime of year. Besides turkey, it also goes really with a nice pork tenderloin. A great healthy option for traditional holiday meal. Have fun during this wonderful season of holiday cooking. Happy Thanksgiving from the Memorable Kitchen. Unsalted butter for baking dish, plus 3 Tbs. In a saucepan, combine the quinoa and red rice with the water and salt lightly. Place on high heat and bring to a boil. Reduce the heat to low, cover and simmer until most of the water is absorbed, about 15 to 20 minutes. Set aside. Preheat an oven to 375°F. Butter a 13-by-9-inch baking dish. In a large sauté pan over medium heat, melt the 3 Tbs. butter. Add the onion and celery and cook, stirring occasionally, until softened, 6 to 8 minutes. Add the kale to the pan and cook for 2 additional minutes. Add the parsley or chives and spices and season with salt. Cook, stirring, until the mixture is fragrant, about 1 minute. Transfer the vegetable mixture to a large bowl. Add the quinoa and red rice, cranberries, pine nuts, lemon zest and stock and stir until well combined. Transfer the stuffing to the prepared baking dish and bake, uncovered, for 30 minutes. Let rest for 10 minutes, then garnish with cheese, if desired.